I've been meeting with AMD a lot these days; in fact, one day last week I actually had to reschedule two separate AMD meetings because I was playing host to a few reps from, uh, AMD. With all of the negativity surrounding Phenom and a relatively quiet graphics division, it's tough to remember that I was actually excited about the ATI acquisition back when it happened. These days AMD is beginning to take shape as a total platform provider, thus when I talk to them it can be about everything from CPUs and chipsets to graphics - hence the plethora of meetings. 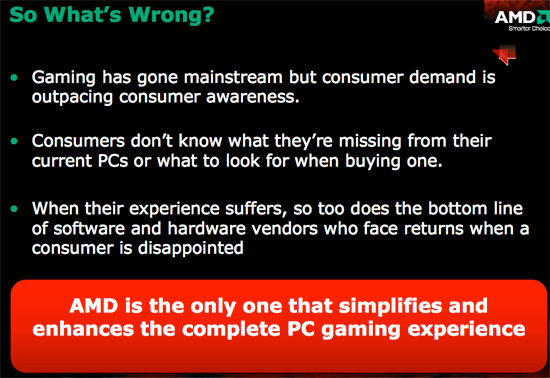 AMD has all of the ingredients to be a major player in the PC business. It arguably produces the best integrated graphics chipset around, is at least competitive on the discrete graphics front and, well, produces x86 CPUs. And today AMD is attempting something very industry leader-like. 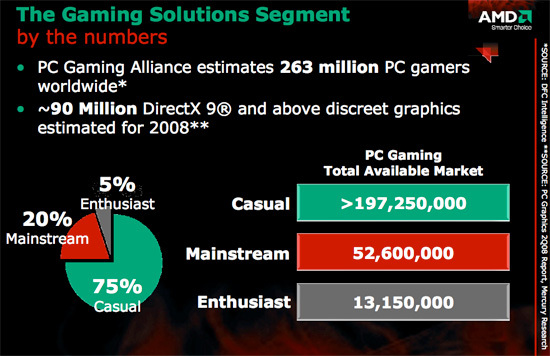 AMD views the PC gaming market as consisting of three segments: casual gamers, mainstream gamers and the enthusiasts. Casual gamers are the largest portion of the market and generally play things like Solitaire or online Flash games. The Enthusiast market is dominated by those who are already investing in good gaming PCs and have some of the highest requirements for performance/visual quality. The mainstream gaming market, however, is composed of those users who want to play more demanding games on their PCs but aren't always aware of what they need to do so. 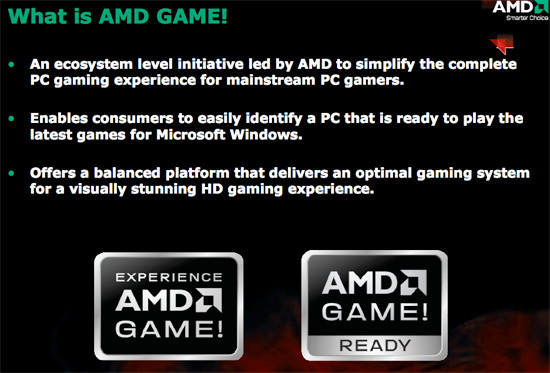 In order to help address the needs of this mainstream gaming market, AMD has established a new logo program called AMD GAME!. The idea behind AMD GAME! is to guarantee that anyone buying a PC with this logo will have a good overall gaming experience with it. And how many out of the (estimated) 250 million casual and mainstream gamers are overclocking? Much more than the total of the (estimated) 13 odd million enthusiast gamers? I dont think so. So your Phenom X3, which was launched a couple months ago, compares similar to the first processor in a line launched well over a year ago on (most likely) single-threaded code? I used AMD exclusively on the desktop for about 7 years but bailed when they hosed me over on two sockets longevity (Athlon64 platforms) and the fact that Intel got their act together and made a better product. But yes, processors are fast enough now that people don't notice the increase fro 90fps to 100fps or whatever. Exactly. This is a mainstream platform. It's not meant to win any benchmarking awards. Fact is most desktop PCs come with integrated graphics. Even a C2D system with integrated graphics won't play games well. Phenom X3 and X4 processors and ATI graphics cards are more than capable of playing todays games. Are they necessarily the fastest out there? No. But they don't have to be. ....but I do not think that it goes far enough. I believe the games themselves should have a certification to go along with the hardware. Like 'Game A' is certified for Extreme or something and the computer has the matching certification. Which means 'Game A' would need an 'Extreme' certified PC to run at the game's maximum settings. So the game could be labeled 'Extreme' for resolution 1920x1200 and up with maximum game settings and for smaller resolution, say 1600x1200 it would only need a 'Mainstream' Certification. Also what about as time goes by? Amd can have my slogan, I will sell you "Game On Baby!" for a Zeelleon dollars. They exclude gaming on small electronic devices why? I've seen people in traffic playing cellphone games. Does this mean Pc gaming is still alive? Pc game development seems to die.